VDKs (Vicinal Diketones) are metabolic products of yeasts which form in constant proportions during fermentation. These include diacetyl, which forms in the highest concentration. It is important to monitor vicinal diketones levels during fermentation, as excessive VDKs production may be a sign of incorrect fermentation, bacterial or wild yeast infection. Furthermore, VDKs concentration plays an important role in the formation of flavour during the beer maturation time. Vicinal diketones (VDKs) levels can be measured using CDR BeerLab®, a system which enables you to carry out a wide panel of chemical analyses on beer and water, using a single instrument, in a process that is faster and simpler than traditional methods. Time testing: one test 5 minutes + distillation time. The CDR BeerLab® method for the determination of VDKs has good accuracy and is good for analyses requiring distillation and spectrophotometric measurement as is established in the report “Evaluation of new features (VDK, yeast vitality) of the CDR BeerLab® Analyser” performed by the international reference laboratory Campden BRI, innovation, research and technology centre for the food and drinks industry. 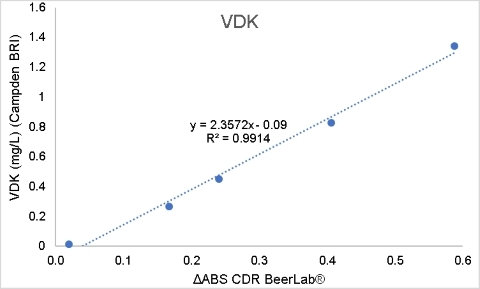 5 beer samples were analysed in triplicate for VDKs using the CDR BeerLab® method and the reference UKAS accredited VDK method (Campden BRI Method AM/008 based on Analytica-EBC, 9.24.2, 1999), showed that the results were similar (correlation R2 = 0.99). The beer sample must be distilled. Vicinal diketones contained in the distillate react with an alpha-naphthol and creatine solution to form a coloured complex which absorbs at 520mm. The extent of absorption is proportional to concentration. What is the diacetyl taste? What is the effects of diacetyl and other VDKs on the organoleptic profile of a beer? Check out the key points about Diacetyl and VDKs in brewing process. A distillation method is required to carry out the test. De-gas and distil 100 mL. Recover the first 15 mL, bring to 25 mL and analyse using the instrument. Vicinal Diketons (VDKs) was last modified: February 19th, 2019 by CDR s.r.l.